Security forces inspect the site of a suicide bomb attack in Kabul, Afghanistan, Nov. 29, 2018. 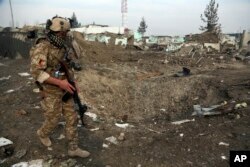 Taliban insurgents staged a deadly coordinated attack targeting a British security firm in the Afghan capital Wednesday. A British security contractor, G4S, says five of its employees, including a Briton, were killed and 32 others injured in an overnight gun-and-bomb attack against one of its compounds in the Afghan capital Kabul. The company said Thursday five employees have been “seriously” injured. Afghan officials confirm the attack on the well-guarded facility in Kabul killed a total of 10 people and injured many more. "We are committed to our security role in support of the people of Afghanistan, and we are determined that incidents such as this will not prevent the vital work that the international community conducts from continuing,” said Charlie Burbridge, the company’s managing director. The Taliban has claimed responsibly for the suicide raid, saying it inflicted heavy casualties on both Afghan and “foreign occupying” forces inside the compound. G4S is a leading global security company providing security for the British Foreign and Commonwealth Office in Afghanistan. Taliban spokesman Zabihullah Mujahid said the attack began Wednesday with a suicide bomber exploding a vehicle-born bomb, making way for four other heavily armed “martyrdom seekers” to storm the compound. An Afghan security forces member walks next to a crater caused by a suicide bomb attack in Kabul, Afghanistan, Nov. 29, 2018. He claimed the targeted compound was being used to plan attacks in Afghan provinces of Kandahar, Helmand and Nangarhar. Mujahid said the attack was a “response to recent enemy atrocities against civilians" in these provinces. Afghan officials and residents have confirmed dozens of civilians, including women and children, have been killed in recent airstrikes in Kandahar, Helmand and Nangarhar. The spike in insurgent attacks comes as the United States has renewed efforts for a negotiated settlement to the conflict with the Taliban. U.S. special envoy for Afghanistan peace and reconciliation, Zalmay Khalilzad, is leading the peace efforts. He has held two rounds of talks with Taliban representatives in Qatar in recent weeks. “Yes, we are in a hurry to end the Afghan tragedy, the Afghan people deserve peace. They have been at war for 40 years," he told PBS TV on Wednesday when asked whether he was attempting to strike a peace deal before the Afghan presidential election in April. “Everyone, starting with the President (Donald Trump), would like to see the war in Afghanistan end, that there would be reconciliation and peace among the warring factions,” he noted.